is honored on Panel 21W, Line 94 of the Vietnam Veterans Memorial. Thank you for your service and your sacrifice. Thank you for stepping up and answering your country's call. You gave everything you had to give. Rest easy knowing you will never be forgotten. Born one year apart. You died 10 days before I was wounded. Lost three of my platoon that day. Don't know how I survived. Had I died we would be on the same wall only a few lines apart. Semper Fi my cousin. We finally found you, Marine ! Now, we pay you full honor - your USNA Class. You raised your right hand I-Day at USNA, 30 June, 1965, and joined the Class of 1969.Within three months, you had contracted double pneumonia and, were regrettably, unable to keep up with studies and unforgiving physical demands of plebe indoctrination. You left quietly with but no option. But, you felt compelled to serve your country again - once fully well, You joined the U.S. Marines. So sadly, we now remember you as a patriot warrior and hero. The Class now knows, after half a century passed, that you gave your last full measure in Viet Nam.But, sir, a hero's welcome and memory we do now give you. Your selfless sacrifice for country is not lost to your mates of 1969. 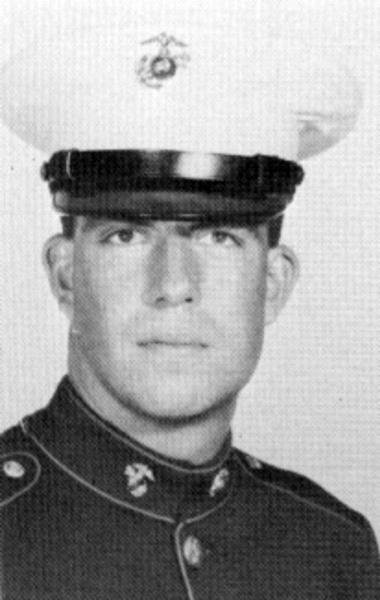 4 other members of Platoon 396 were KIA in Viet Nam.